Beautifully Updated Split-Level Home out in Copper Ridge! The Main Level features a Large Entryway, an Open-Concept Floorplan with an updated Kitchen, nice sized Dining Room, and Large Living Room. There's a large Master Suite with Master Bath and Walk-in Closet, there's also another nice sized Bedroom, and a Full Bath. Downstairs you find a Beautiful Family Room with Designer Niche's, a Gas Fireplace, Wet Bar, wired for Surround Sound, and a Walk-out to the Patio in the Backyard! There are 3 nice sized Bedrooms in the Basement, a Full Bath, Utility/Laundry Room, and lots of storage under the Stairs/Entryway. The Exterior has a Triple Garage which is Finished, has a hanging Gas Furnace, Hot/Cold Water, Floor Drain, and Cabinets. There is a niced sized Deck, and Large Stone Patio which is perfect for Entertaining. 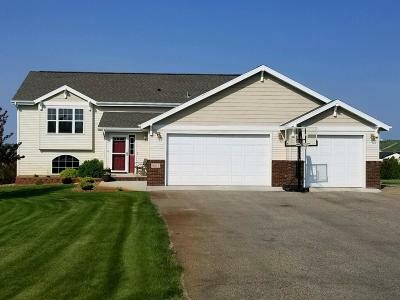 There are mature trees, Beautiful Landscaping, a Sprinkler System with a Well and Pump, with additional spigot locations, all situated on a large 1.5 acre Lot! Contact your favorite REALTOR to see this Property today!